Thank you for taking the time to visit my website. 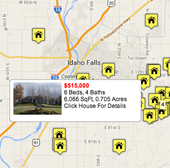 I specialize in assisting buyers and sellers in the greater Idaho Falls, Idaho area. My website contains ALL listings from ALL Real Estate Agents. New Shelley Listing with 6 bedrooms, 4 bathrooms and 4650 square. "This is it. Five acres just waiting for you. Custom home with six bedrooms 3.5 baths. Gourmet kitchen with views that are worth coming home for. Laundry room which will make you want to do your laundry. Theater room with seating and all electronics included and ready to go. Outside you will find a custom basketball court, several gardens, a patch of raspberries that you will get lost in, fruit orchard with over 30 trees that are producing fruit, apples, pears etc." New Rigby Listing with 6 bedrooms, 3 bathrooms and 4292 square. "GORGEOUS COUNTRY HORSE PROPERTY!!! This incredible home is perfect for your family AND animals!! Located east of Rigby in the rural beauty of Jefferson County, this home has open, soaring ceilings and large windows along with granite counter tops, tile floors and high end finishes! 6 bedrooms and 4 bathrooms with completely finished basement and high end finishes! Central air conditioning, automatic sprinklers, walk in closets - all of those little extras you desire!! You will love the large barn with stalls and new fencing!! This is the perfect place for everything the equestrian dreams of!! Come and take a look and enjoy all of the amenities!! You will LOVE it!!" New Rigby Listing with 5 bedrooms, 5 bathrooms and 5154 square. "Immaculate Condition Ready To Move Into! Exquisite tiled entry with elegant lighting leading to formal dining and office. Great room has vaulted ceilings & beautiful fireplace, gourmet kitchen, stainless appliances, granite counters, unique inlaid hardwood floor. Amazing master suite with tray ceiling, sumptuous bath with dual sinks, separate sit down vanity area, huge step up jetted tub & walk-in shower. Theater located in the bonus room over garage with a wet bar for easy snack access & a half bath. Walk-out basement completely finished w/3 bedrooms, bath, family room & access to the backyard. Circular driveway, extensive flower beds, mature trees, stamped concrete. Bully Barn for extra storage. Garden area & fabulous greenhouse. WOW Solar system-no more electric bills. All lighting has been updated to LED bulbs." New Idaho Falls Listing with 6 bedrooms, 4 bathrooms and 4400 square. "This gorgeous, one-of-a-kind custom home sits breathtakingly constructed on the banks of the famous Snake River. From every inside angle of this stunning residence owners are greeted with natural light, lush landscaping & views of meandering water. A grand entry opens to a formal dining room & dream kitchen guaranteed to delight every culinary chef! This beautiful space showcases custom cabinets, granite countertops, a hidden combination butler's pantry/laundry room & a full set of sleek upgraded appliances. A large master suite, with private deck access & water views, gives way to an expansive ensuite bath; a jetted tub sits separate from a tile-surround shower, while the dual sink vanity & enviable walk-in closet ensures everyone is daily afforded adequate grooming space. Enjoy spending your free moments relaxing at home? Your weekends will be undisturbed as you enjoy the latest movie releases comfortably in your home theater room, sitting adjacent an open family/rec room. Boasting large bedrooms (with multiple walk-in closets) an abundance of great storage solutions, lofty ceilings, upgraded trim & molding & a tastefully fashioned floorplan designed for entertaining, this rare find guarantees no detail or thought have been missed in this dream residence!" New Rexburg Listing with 5 bedrooms, 3 bathrooms and 3388 square. "WOW 10 year old home barley lived in, 6 acres with water rights, shop, 3 car garage, only 10 minutes from Rexburg. 3 bedrooms on main floor with 2 full baths, Bonus room above garage that is finished. Second partial kitchen down stairs. Huge family room down stairs. Hard to find a home like this on acreage." New Blackfoot Listing with 4 bedrooms, 3 bathrooms and 4206 square. "This home has everything you could want with a rural property, while also being just minutes from town! This large home has endless possibilities and is very spacious. On the main level you will find multiple family rooms, a sun room, den/office, and a wonderful formal dining room for all your family get togethers. The master bedroom is very spacious with a large walk in closet. Original hard wood floors cover the main entry throughout the kitchen and dining room. The laundry room is also on the main level. The garage apartment has 3 bedrooms and 1 full bathroom and also a separate access option. Downstairs you will find a family room that could serve many options, a theatre room, game room, or man cave! Also on the basement level is a great size storage room complete with a work bench, shelving, and another separate storage facility within this room. Some of the additional features include A/C, central vac, and much more! The exterior features of this home are almost too good to be true. There is a separate, 40x60 - 4 bay shop in addition the the 2 car garage attached to the home. Large areas for parking, RV's, trailers, and more. The property behind the home has a chicken coop, horse amenities, and sprinkler pipe. Basically this home has everything and more, call us today!" New Island Park Listing with 3 bedrooms, 2 bathrooms and 1296 square. "HENRYS LAKE WATERFRONT, amazing views of Henry's Lake and surrounding mountains. Beautiful established lawn and private boat dock. This adorable cabin will make a wonderful place to have family and friends create lifetime memories. This home is being sold furnished and ready to move in. With 3 bedrooms plus 2 extra sleeping areas and 2 bathrooms there is lots of room. The deck wraps around the cabin and is covered. A cozy living room with a wood stove for when the seasons get chilly. If you are a fan of world class fishing, this is the place for you! It is only 15 miles(approximately) to WestYellowstone and the entrance to Yellowstone National Park. Community water, road maintenance included in HOA fees and subdivision has community boat ramp." New Shelley Listing with 3 bedrooms, 4 bathrooms and 3132 square. "Beautiful country home on 10 acres in the Shelley/Firth area. This 3100 sqft country home comes with 4 bedrooms and 3 bathrooms. The property includes a 2 car attached garage, a 2 car detached shop and a run in horse shed. Come take a look at this great property today." New Idaho Falls Listing with 6 bedrooms, 3 bathrooms and 3079 square. "Great Subdivision Carriage Gate - Allstar Homes Presents the popular Journee Plan - with over 1500 sq ft vault ceiling, Large Master with Trey Ceiling, 2 additional bedrooms up and 3 Car garage, Please request a copy of our list of features and benefits and a private Tour. We would love to hear from you today!" New Idaho Falls Listing with 5 bedrooms, 3 bathrooms and 3054 square. "IMMACULATE HOME! This 5 bedroom 3 bathroom home has been impeccably kept inside and out! The Kitchen has an abundance of storage, newer appliances, pantry and an adjacent Dining Room for entertaining. Through the Living Room lies a large covered deck for your BBQ's and get- togethers. The Main Floor Master Bedroom has Master Bathroom and Closet. 2 other good sized bedrooms, main floor bathroom and main floor laundry round out all the necessities for your needs! The finished Basement includes large Family Room with Gas Fireplace, Office and Game Room space, 2 more Bedrooms, a Bathroom and Cold Storage Room. The abundance of gathering areas throughout make this the perfect home for company. The fully finished, extra large , 2 car garage has plenty of storage space. Gorgeously Landscaped Fully Fenced Yard, New Roof, Siding, A.C. and Crown Molding are among just a few of the great features of this home!" New Idaho Falls Listing with 5 bedrooms, 2 bathrooms and 2160 square. "Solid Brick Home Centrally Located in Idaho Falls. This 5 Bedroom 2 Bath Home Has Just Had a Makeover and is Clean and Move-In Ready. The Freshly Painted Main Floor Features a Large Living Room With Lots of Natural Light and Gorgeous Refinished Original Hardwood Floors. The Kitchen has New Lights, New Flooring, New Countertops, New Cabinets, Newer Appliances and Dining Area with Back Door Leading Out to Covered Patio and Fenced Back Yard. 3 Nice Sized Bedrooms and a Full Bath with Tile Tub Surround Complete the Upstairs. Enjoy the Downstairs Family Room with Decorator Shelving, New Carpet, Lights and Paint. Great Master Bedroom and Bath with Walk-In Closet Allows Separation and Privacy. There is Also One More Bedroom and the Laundry Located in the Basement. Gas Forced Air Furnace and City of Idaho Falls Utilities Help Keep Costs Down. This is One You Don't Want to Miss! Schedule A Showing Today!" New Idaho Falls Listing with 3 bedrooms, 2 bathrooms and 1948 square. "Wonderful opportunity to own this fantastic home in a super neighborhood sitting on .79 of an acre. This home has vinyl siding and a metal roof so very little outside maintenance will be needed. This 3 bedroom 2 bathroom home features vaulted ceilings, large bedrooms, formal dining area, open kitchen with lots of counter space, spacious master bedroom, master bath with dual sinks, walk in closet, garden tub and a separate shower. There is a nice family room just off the kitchen with a gas fireplace. There is also a mud room and laundry area going out to the attached garage. The front of the home features a covered porch and the rear features a covered deck. In addition to the garage you will find 3 separate storage sheds. The back yard is fenced and the front is nicely landscaped. All the appliances stay including the washer/dryer and water softener." New Idaho Falls Listing with 4 bedrooms, 2 bathrooms and 2200 square. "This comfortable home, on a large corner lot, sits just a short walk from the local elementary school and only minutes from access to great dining and retail. An inviting living room, just off the entry, opens to a spacious dining and kitchen area warmed by natural light filtering through the windows. The main floor showcases three bedrooms and a full bath, each constructed near the back of the home for added ease of access and movement between the spaces. Downstairs you'll discover a large family room with a brick surround pellet stove cozying up with the family for movie nights on the big screen will be a welcome release at the end of a long week. Additionally, buyers will love the expansive master suite found here - with a walk-in closet and nearby bathroom, privately tucked away from high traffic areas of the home. From the dual hall closets, to the bonus linen cupboard and unfinished sq. ft. in the basement, this wonderful home is abounding with options to easily stow your personal belongings organized & out of sight. Even more, the fenced yard, mature landscaping with auto sprinklers and sprawling open deck make the exterior of this home just as inviting as the relaxing interior spaces. This affordably priced home is sure to be a great fit for your growing household." New Idaho Falls Listing with 5 bedrooms, 2 bathrooms and 2336 square. "This is a great opportunity to own a home in a fantastic established neighborhood. Check out the 3d tour of the space which includes 3 bedrooms on the main floor and two bathrooms. Then walk into a large open basement with 2 bedrooms off to the sides. A portion of the basement remains unfinished ready for someone to add an additional bedroom and bathroom. The home has an attached 2 car garage and a great little backyard. Home is located within walking distance to site bus stop." New Idaho Falls Listing with 4 bedrooms, 2 bathrooms and 1824 square. "Nice home that needs a new owner. Stainless appliances, Big fenced in back yard, nice big workshop. Has open finished laundry and storage. This has a newer roof and some updating has been done. Come see and buy this home!" New Blackfoot Listing with 2 bedrooms, 2 bathrooms and 1113 square. "Nicely maintained twin home featuring 2 roomy bedrooms and hardwood floor throughout! Enter into living room with access to the single car garage immediately on your right. There is a coat closet then the main bath with tub/shower combo and toward the back of this bath is the laundry area. Moving through the home, the first bedroom is on the left with the kitchen expanding on the right. There is ample granite counter tops, cabinetry,with easy flow for prep and clean-up. The generous counter is perfect for a snack bar if stools were present. The dining area has open walls for a cabinet, or it even could be used for a casual family or den area. The Master bedroom and bath are on the left. The master window opens south, so natural light abounds. The bath has a single sink, tub/shower combo and is in pristine condition. Flooring in the baths is vinyl. The back yard is fenced, raspberries/strawberries/perennials will delight the new owner during the warm summer. A small deck has been added for ease of access as well as a tidy patio. This move-in ready home is long on appeal, and expected to be available for a short time before being picked by that savvy buyer! Gas heat/AC are the bonus!" New Idaho Falls Listing with 3 bedrooms, 2 bathrooms and 3958 square. "Beautiful Immaculate Home Located in the Prestigious Southpoint Subdivision. Bright Airy Open Floor Plan Offers a Kitchen Sure to Delight Any Chef with All Stainless Appliances Including Convection Oven with Warming Drawer, Granite Countertops, Breakfast Bar and Corner Pantry. The Family Room with Vaulted Ceiling and Decorator Shelve Has a Gas Fireplace for Warmth and Ambience. Enjoy the Spacious Dining Area with Sliding Doors Leading to the Fenced Backyard. The Master Bedroom is Large and Can Easily Accommodate Oversized Furniture. If Your Heart's Desire is to Have A Gorgeous Master Bath With Dual Vanities, Deep Jetted Tub, Separate Tiled Shower and Water Closet then This is the Home for You! Two More Generous Sized Bedrooms, A Full Bath, Laundry and Mudroom Complete the Main Floor. Downstairs is a Substantial Family Room with an Electric Fireplace and Plenty of Space for Entertaining. The Balance of the Downstairs Square Footage is Roughed- In and Ready to Finish More Bedrooms, a Full Bath, an Office, Exercise/Play Room and or Storage Room. Tastefully Landscaped with Numerous Trees, Full Automatic Sprinklers and Drip System in Flowerbeds. 3 Car Garage with Room for Storage. Call Today to Schedule a Showing and Make This Your New Home!" New Rigby Listing with 6 bedrooms, 3 bathrooms and 3700 square. "Beautiful Custom open floor plan! Beautiful open kitchen for entertaining, Vaulted Ceilings, Main floor, den, office, or formal living room, main floor family room with beautiful fireplace insert. Main floor laundry with laundry sink, Master bedroom with tray ceiling, walk in closet. Master bath with custom tile shower with two shower heads, and double sinks. 5 additional huge bedrooms. Large great room in the basement set up as theatre room, and addition seating around a second fireplace insert with a beautiful mantle. Huge storeroom with additional food storage room containing built in shelves. The basement is fully finished. Bathrooms are all custom beautiful bathrooms. Home features and oversized 3 car garage with built in cabinets. Huge Rv parking area. The back yard is fully fenced with additional space and grass on both sides. Storage shed. Mature trees on West boarder, full sprinkler system front ad back. This home has been very well taken care of. Hot tub on patio included. Schedule your personal showing today!" New Idaho Falls Listing with 6 bedrooms, 4 bathrooms and 3444 square. "WOW!!!! Look no further.... this home has it all!! This immaculate home features a huge custom kitchen, with tile floors, granite counter tops, stainless steel appliances and vaulted ceilings. The great room has beautiful hardwood floors, a gas fireplace, and large windows to view the pristine back yard! The large master suite has a jetted tub, separate shower, and an extra large dual vanity! The rest of the main floor has a large living room, 2 more bedrooms, a full bath, a half bath and a large laundry room! The basement features a huge tastefully decorated family room with a gas fireplace, 3 large bedrooms, a full bathroom, large storage area and a cold storage room! The back yard is manicured with trees, 2 play areas, and a large trex deck! THIS HOUSE IS IMMACULATE!! Come take a look!" New Rexburg Listing with 6 bedrooms, 3 bathrooms and 3148 square. "Welcome to this beautiful home in the Stonebridge subdivision! Built in 2016, this home has only been occupied since 2017, and it has been lovingly cared for and thoughtfully tended ever since! A spacious open living area and kitchen, three bedrooms, two full baths and laundry on the main floor accommodate all needs wonderfully without requiring additional square footage - but wait, there's more! The fully finished basement boasts another three roomy bedrooms and another full bath, as well as a large family room with media area ready for recliners and movie screen! The home environment is made even more comfortable with a NEST thermostat. Since owning this wonderful home, the current sellers have completed the landscaping, including full lawn with a smart sprinkler system (can be remotely controlled by phone), fruit trees, garden area with raspberries, and a partially finished vinyl fence. Call today for a private showing of your new home!"